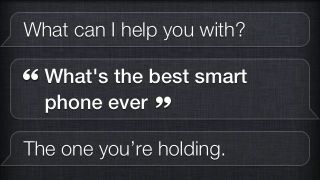 Guess who Siri says is the best smartphone now? She's not without a sense of humor, is she? The iPhone 4S' personal assistant, Siri, has a penchant for making jokes but sometimes she can go a little too far. Such was the case last week when Siri decided to start telling users that the Nokia Lumia 900 phone was the best smartphone ever. Siri's answer came from Wolfram Alpha, one of the search services Siri uses to find the answers for inquisitive iPhone 4S users. When asked about the "best cell phone ever" the search service simply looked for the one with the highest customer review average, which happened to be one of Siri's direct competitors. Such honesty is refreshing from our technology, but not everyone appreciated Siri's off-brand hiccup. Asking Siri the same question today results in more sarcastic responses in favor of Apple's iPhone 4S. "You're kidding, right?" Siri replied when asked which is the best smartphone. It then tried to play innocent when asked a second time, asking us back "wait… there are other phones?" A third query yielded similar results, with Siri explaining "I think you've already answered that question." TechRadar reached out to Apple regarding Siri's change in tune, but has not yet received a reply. If Apple is censoring Siri then this is troubling news indeed. If we cannot trust a highly marketed Apple-exclusive feature to give us objective analysis about itself, well, then who can we trust in this world?